Barbara Blue may have originally been from Pitts- burgh, but after spending years in Phoenix, Detroit and back in Pittsburgh, she landed a gig in 1997 at Silky O’Sullivan’s on Beale Street in Memphis where she has been performing 5 nights a week for 21 years. Within this time frame, she competed at the early years of the International Blues Challenge and did a number of blues cruises where she met the Phantom Blues Band which led to recording three albums with them. Jim Gaines produced, engineered & mixed this and there are some superb musicians on it including: Bernard “Pretty” Purdie - drums, Will McFarlane - gui- tar, David Smith - bass, Lester Snell keyboards, Rick Steff - Hammond B3, Mark Narmore - keyboards, Mi- chael Toles - guitar, Lannie McMillan - tenor sax/horn arrangements, Jim Spake - baritone sax, and Marc Franklin & Steve Graham - trombone, along with some backing singers. There are cameo appearances by Al Kapone, Johnny Lee Schell (of the Phantom Blues Band), and Scott Sharrard. This, her 11th album, is an impressive one marked by the authority of her husky, full-throated singing. She may be a powerful singer, but not an overbearing or strained one, as heard on the opening “My Heart Be- longs to the Blues,” with some nice guitar on a lyric by her, Narmore and Sandy Carroll about her singing and traveling singing the blues. Furthermore, the restrained backing complements her and does not overwhelm her. It is followed by “Johnny Lee” (I believe by by Scott Sharrard) which evokes memories of Katie Webster swamp-pop blues. Johnny Lee Schell is on guitar here as Barbara wonders what Johnny Lee has done to her. Next up is a down and dirty slow blues that one can imagine Koko Taylor having done, “Accidental Death,” with Sharrard’s slide guitar heard over the relentless, driving groove. Blue is a very strong singer, although I would rate her a notch below Taylor and Webster. title track, a moody slow blues, was originally done by Koko Taylor and Barbara Blue’s compelling vocal is complemented by rapper Al Kapone in a duet that imaginatively reworks this song. It is followed by a superb, soulful performance on a ballad she wrote with Narmore, “Walk Away.” Another notable performance is “Wild Woman,” where she sings about some of the things some women do. “That’s Working For Me” has a nice walking tempo and some really nice playing by saxophonist Lannie McMillan. Spooner Oldham collaborated with Narmore and others on “Slow Born,” as Barbara sings with smolder- ing fervor about memories burning slow, especially things one wants to forget on a gem of a southern soul performance. The album closes with a brooding inter- pretation of Robert Johnson’s “Come In My Kitchen.” Barbara Blue is a very strong singer, and even if I rate her a notch below Taylor and Webster, with quality songs, her own vocals and backing that supports her singing, she has produced a striking recording. 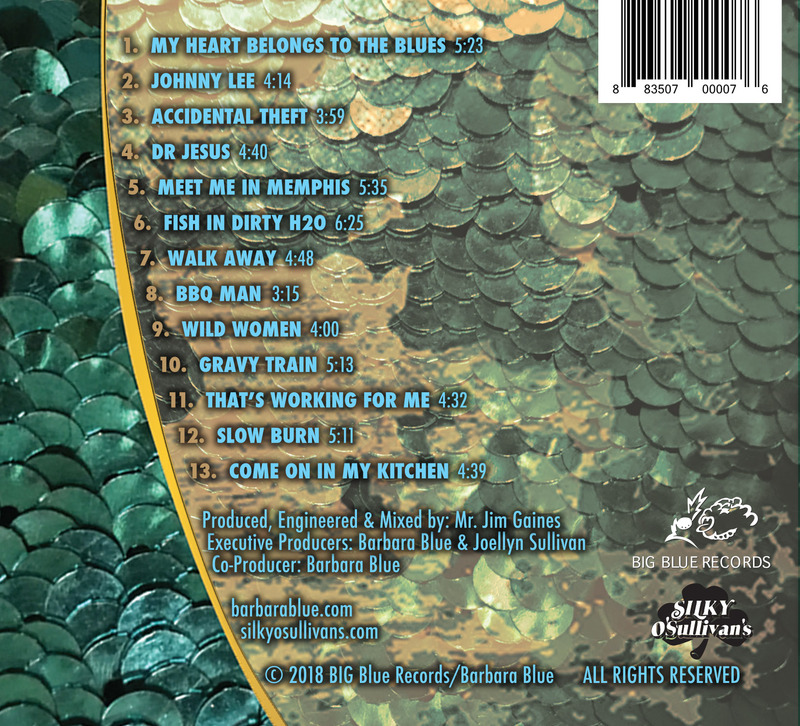 Blue also co-produced the disc with Jim Gaines, and co-wrote fiive of the songs with Narmore and Sandy Carroll. The opener, “My Heart Belongs To The Blues,” is a sweet slow burner that could be classified as Blue’s “Mission Statement,” and features a great solo from McFarlane. The rock n’ roller “Johnny Lee” appropriately includes Schell on guitar and it’s a swinging adaptation of Scott Sherrard’s “Angeline,” from his recent album. Speaking of Mr. Sharrard, his exquisite slide guitar is a highlight on the driving boogie “Accidental Theft,” and “Dr. Jesus” is a gospel/R&B raver (with sweet backing vocals from Sweet Nectar – Maureen Smith and Lynette “Sue” McCracklin, and Lorina McMinn and Candace Mache) that will make an unbeliever get up and testify. If the powers that be in the City of Memphis have any clue at all, they should make Blue’s version of Eric Hughes’ “Meet Me In Memphis” the official song of the city. She sings the praises of the Bluff City with passion and verve. The moody title track, an old Koko Taylor “B’ side, features rapper Al Kapone with Blue and her reimagining of the song gives the disc a modern touch, and “Walk Away,” co-written by Blue and Narmore, sounds like a long-lost Malaco soul blues ballad. “BBQ Man” is a…well….saucy and spicy track, and “Wild Women” is a simmering slice of funky R&B. 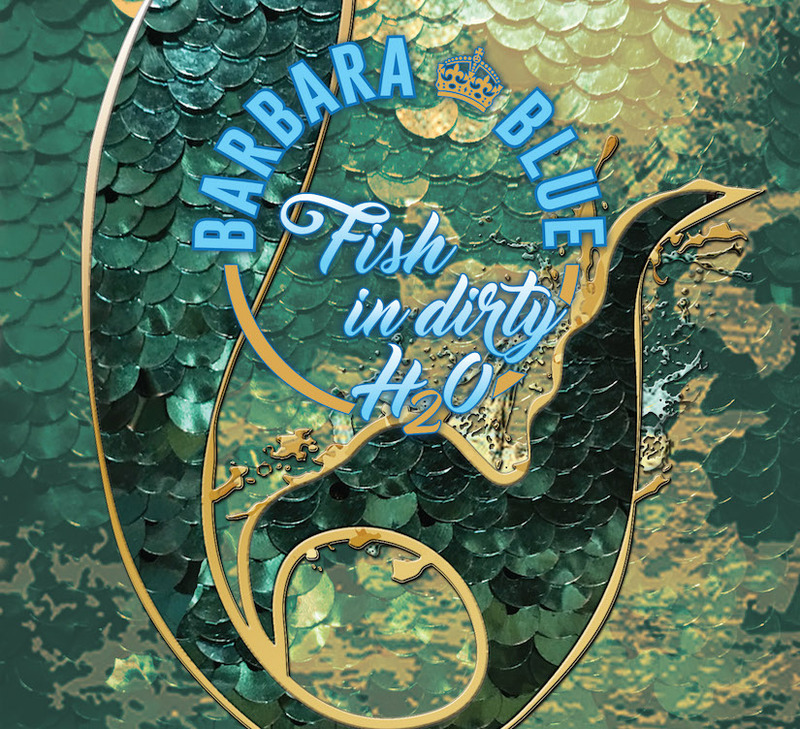 A superb mix of blues and R&B and traditional and contemporary, Fish In Dirty H2O is Barbara Blue at her very best. I’ve been listening to her 2002 release Sell My Jewelry, and it’s been a lot of fun watching her career grow and develop. The talent has always been there and it’s good to see that the audience is finally catching up. Barbara Blue review…September 3, 2018…..
You ain’t been to Memphis until you’ve been down on the heart of Beale Street most any night of the week at Silky O’Sullivan’s whenever Barbara Blue is holding court. We’ve known Barbara for some twenty years now, and she never fails to put on a powerful, fun-filled show. Most nights at Silky’s it’s just Barbara and piano man Nat Kerr, but, for her latest album for Big Blue Records, “Fish In Dirty H2O,” she’s got a full band featuring some of the best players on the planet. Jim Gaines produced the set, on which Barbara wrote or co-wrote six new songs. On drums is the venerable Bernard “Pretty” Purdie, Dave Smith on bass, Lester Snell on keys, and Will MacFarlane on guitar. There is also a true “mother lode” of special guests! We had several favorites, too. “Johnny Lee” is every woman’s dream, and is a cool, Fifties-inspired cut, with—you guessed it—old friend Johnny Lee Schell on guitar! The title cut was originally done by Koko Taylor, but Barbara and guest Al Kapone (who offers a cool rap break at the bridge! ), turns this song into a searing, sultry ode to those legendary lovers. And, with its references to “the banks of the Mississippi” and “the land where soul was born,” the Memphis Chamber Of Commerce oughta make “Meet Me In Memphis” the city’s official song! If you have plans to motor west, do yourself a favor and stop by Silky O’ Sullivan’s and get the reigning Queen Of Beale Street to sing “Bobby McGee” for you, because you ain’t been busted flat in Baton Rouge until Barbara Blue sings it to you! And, be sure to pick up a copy of what is definitely her best work to date, “Fish In Dirty H2O!” Until next time…Sheryl and Don Crow, The Nashville Blues Society. "If you have plans to motor west," a great place to stop is, of course, Memphis. 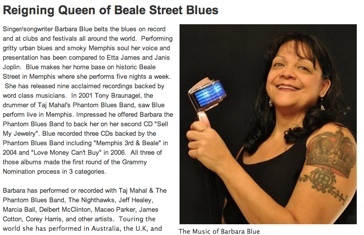 And, on most nights of the week, if you stop in Silky Sullivan's on Beale Street, you can check out one of the most talented women on the contemporary blues scene today, Barbara Blue.